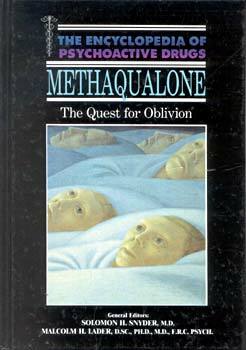 After it was synthesized in 1955, Quaaludes, the most common trade name for the drug methaqualone, were freely prescribed by physicians and quickly gained popularity among illicit drug abusers. Abuse of Quaaludes reached major proportions during the 1960s in Great Britain, Germany and Japan. Their use in the United States increased with such rapidity that by 1984, even physicians' prescriptions for Quaaludes were legally banned. Were the claims that Quaaludes are non-addicting justified? What causes the frightening side effects, including life-threatening seizures and psychotic symptoms? Why are Quaaludes called a "love drug"? Did the sleep disorder clinics know the dangers of the these drugs when they were dispensing them? This book answers these and other questions, and in doing so eliminates the myths surrounding this popular though dangerous drug.